When it comes to furnishing a new office or individual room in your home, your wallet can take a real beating. Most think that buying furniture new is the only way to ensure quality furniture in a timely manner; however that isn’t always the case. Buying used furniture can take a little longer, but can save you money in the long run, along with other benefits that some might not realize. Cost Effective- Like stated previously, used furniture is almost always cheaper than a new, designer named piece of furniture. When you purchase items used, you can normally take the piece home with you that day, which eliminates the fees that come with delivery. Unique- Buying items used gives you the opportunity to own pieces that are no longer available. This gives your room or office its own uniqueness and sets you apart from the rest. Custom- By taking a used framework of a piece of furniture, you are given options on ways to customize the piece to suit your needs. Desks and tables can often times be stripped and then repainted or stained to give the piece a whole new look. Chairs and sofas can be reupholstered or be covered to keep them looking original. These steps to customize your piece can often be done on your own and at half the cost of purchasing brand new furniture. Quality vs Quantity- Often times when you look at current furniture on the market, they contain particle board as well as wood veneer. This is so companies can produce pieces in large amounts without the cost. Older pieces of furniture were often made with real wood, so they last longer than modern furniture. Going Green- By purchasing furniture used, you are eliminating a few carbon footprints. You are eliminating the older piece of furniture from lying in a dumpster or landfill, which helps the environment. You are also eliminating materials and chemicals used to create new furniture as well. 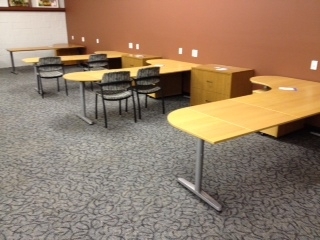 At Mark Downs Office Furniture, we have a wide variety of used furniture to choose from. Whether you need office desks, chairs, or tables, our selection of high quality pre-owned furniture is sure to please even the toughest furniture critic. Visit our showroom today at 10912 York Rd Suite 300C in Cockeysville or continue to browse our online selection. Question about used furniture or any specific piece you have found? Call us at 1.800.281.3696 today! You can also follow us on Facebook , Twitter , LinkedIn and Google+ today! This entry was posted on Friday, June 20th, 2014 at 7:17 pm. Both comments and pings are currently closed.